In the second of a two-part series focusing on disability and legal services on behalf of CILEx Regulation, Jane Hatton from Evenbreak looks at the recruitment and support of disabled employees. The first part is here. 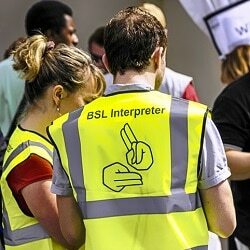 Do you offer a British Sign Language interpreter for interviews? Recognising the benefits of employing disabled people in the legal profession, and attracting talented disabled candidates is a great start, but of little use if your recruitment process is not inclusive nor accessible. Although unintentional, there are many ways that disabled people can be excluded from the recruitment process. Your website is a good starting point. Is it accessible? As recently as 2016 it was estimated that 70% of UK websites do not meet the accessibility standards required by the Equality Act 2010. If your website doesn’t work with text browsers, it will be inaccessible to some candidates with sight impairment, for example. Do you make it clear in all your material that you will offer adjustments that disabled applicants might require for the recruitment process? This could include interviews in a wheelchair-accessible venue, the provision of a British Sign Language interpreter, or assistive technology for any tests. Are the people responsible for recruitment trained in inclusion and accessibility? The much-discussed unconscious bias can come into play when interviewing or assessing candidates who have a physical, emotional or mental difference. For example, an autistic candidate may have all the qualities required for a role, but not be particularly good at the social side of interviews, preferring structured specific questions. Do you offer work experience, apprenticeships or internships as an alternative way of learning and demonstrating ability? Increasingly, law firms are offering these as an additional route into the profession. Ensuring that your recruitment process is accessible is absolutely not about lowering standards, but about removing barriers that may exist to prevent disabled applicants demonstrating their suitability for a post. You are looking for the best candidate for the job, and it’s important that you don’t exclude potential talent from showing you their skills. Though in the last blog I explained how employing disabled people has many benefits for the legal profession, one of the aspects that can put law firms off is the perception that costly adjustments will need to be made to buildings, and policies will need to be re-written. A common ‘reason’ given for not employing disabled people is the lack of wheelchair access in older, perhaps listed, buildings. However, only around 5% of disabled people use wheelchairs, so this is more an excuse than a reason. Offering workplace adjustments for disabled staff isn’t just a legal requirement, it also enables you to help employees be as productive and engaged as possible. The reality is that most disabled employees require very little in terms of adjustments, and those adjustments that are required are of low or no cost. The most common adjustment requested is flexible working arrangements. Good law firms will have this in place already for staff with childcare or eldercare responsibilities, for example. Sometimes an impairment can make travelling in the rush hour difficult, and they may prefer to arrive and leave early. It may be that some employees can do all or part of their duties remotely from home. Agile working also gives staff the flexibility to manage their work-life balance, as the focus is on outputs rather than the time spent at work. This can help to reduce stress, which can cause long-term health conditions or exacerbate existing ones. Technology means that it is easier for people to work from home and interact with their team. Technology can also help with accessibility in the office, and there are many experts available to advise on the most appropriate solutions. But often it is simple things – ensuring the walkways are clear of clutter for someone with sight impairment, for example, which is good practice anyway. If there is a requirement for specific equipment, Access to Work, a government-run organisation, can help to identify and pay for or towards the equipment. Jane Hatton founded Evenbreak, a specialist job board run by and for disabled people, helping inclusive employers attract more talented disabled candidates.